The 8-0 continues to haunt us and i guess it will keep haunting us for some time to come. It is always sad when a sportsman retires. These are people in the prime of their lives suddenly having to give up not only what they are best at but often the only thing they know. “This series was meant to be a fitting final trophy but has ended in tears. An era is over in more ways than one. So after all the misery and rage, Indian cricket fans will perhaps tune in to the Adelaide Test not hoping for a turnaround – the time for that has long passed – but for a final glimpse of their batting heroes. Who knows how many of them will turn up at the next Test?” This was Sambit Bal before the Adelaide Test. How prophetic these words seem now. The 8-0 has claimed two of Indian cricket's biggest stalwarts. To be honest, this was always going to be inevitable. It was always a matter of ‘When’ rather than ‘If’. Hard to blame the selectors or MSD here. 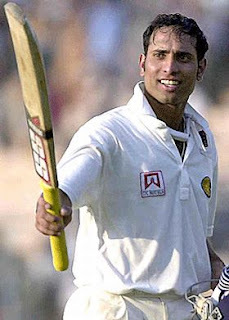 Having said that, world cricket will undoubtedly be poorer without Laxman. What an ambassador of the game he has been. I don’t know why, but to me, there was always a certain quality of sadness in Laxman’s batting. Don’t get me wrong, it is a joy to watch him bat but there was a certain underlying fragility in it. There was none of Dravid’s solidarity or Sachin’s perfection, it was more like watching magic being created; it did not seem to belong in today’s world, didn’t seem as if it would survive. Perhaps, it was only me seeing the vulnerability of his early career reflected in his batting, whatever it was, i never wanted to miss watching Laxman bat for i was afraid i will not be fortunate enough to witness something as beautiful again. Laxman had this magical ability to warp and distort time. Never the one to rush, he still had ample time to face the fastest of bowlers. There was nothing violent in his batting, it was all grace. There was no flourish in his strokes yet plenty of style. A mere push would send the ball racing away. It was as if the ball was there to pander to Laxman's whims. The bat only sent the message across. He could caress a ball pitched on the fourth stump through extra cover or he could whip it through mid-wicket. This was not the stuff of mere mortals, this was magic. As John Wright once said to a young kid "Watch him bat but don't try to emulate him." Yet, Laxman was not only about style. He had substance too ,plenty of it. An extremely versatile batsmen, he has batted at all position excepts ten and eleven. Having struggled in the initial part of his career, he found himself as a make-shift opener. His 167 in Sydney earned him some much-needed time. Laxman took a bold gamble and declined to continue as an opener. He would fight for his place in middle order. And boy oh boy, did he make a fist of it. His 281 against Australian at the Eden Gardens in 2001 was the best innings ever played by an Indian and will remain so for many years to come.That day at Eden Gardens, Laxman elevated the art of batting to hitherto unexplored heights. Runs flowed, records tumbled and the Aussie spirit was broken. Steve Waugh's final frontier remained unconquered. It was an epochal innings in more ways than one. His love affair with Australia was firmly established. But, more importantly, it turned out to be a water-shed moment in Indian cricket. Indian cricket was yet to recover from the match fixing saga but that victory gave us new hope. A rejuvenated team under the brilliant leadership of Saurav Ganguly and the guidance of John Wright started a process that would result in India reaching the No1 spot in Tests and winning the T20 and 50 over world cups. It all started with Laxman and the glorious era lasted till April2, 2011. The golden age of Indian Cricket would last 10 years. In those 10 years, we had 4 captains, 3 coaches, many disasters but also many a special victory to savour and relish. Finally, he found his true calling at no5 & no6. At the twilight of his career, he treated his fans to some truly special innings. Shepherding the tail expertly, Laxman scored a century in Sri Lanka, 73 in Mohali and 96 glorious runs in Durban.The common thread among all the three innings was the fact that all of them came in the second innings and were also match winning. The 96 in Durban was one of the finest exhibition of batting i have ever had the good fortune to see. Yet, his form deserted him in the all important campaign against England and Australia. His batting was a pale shadow of the magic he displayed in the year gone by. Sadly, the decline in form proved terminal. When the end arrived, it was all too fast and came without any warning. In many ways, Laxman was an unlikely hero. He had neither Sehwag's flair nor Tendulkar's sense of destiny. None of Dravid's solidarity nor Ganguly's aggressiveness; not even Kumble's never-die spirit. What Laxman had instead was a remarkable sense of occasion. As the crisis gets bigger, the opponents tougher and the odds higher, the best in Laxman emerges. Amid chaos and panic, Laxman is an oasis of calm. Watching Laxman bat, one can never tell the state of the match. Adversity brings the best out of Laxman and this is the key to his numerous match winning innings. So, what is Laxman's enduring legacy to the game of Cricket in general and Indian cricket in particular? To me, it will be the remarkable grace he has brought to the game. In this regard, Laxman is in August company that includes the likes of Mark Waugh, David Gower, K.S Ranjitsinghji and Mohd. Azharuddin. On and off the field, Laxman has carried himself with great poise and dignity. Courting neither fame nor controversy, Laxman still managed to find a place for himself in the pantheon of Indian greats. He has certainly enriched the proud tradition of Indian batting. It is with a heavy heart that i bid VVS. Laxman goodbye and wish him all the best in his future endeavours. As Ian Chappel put it, you are indeed 'Very Very Special' Laxman. Lance Armstrong - A Fallen Hero! Really?